futureztrunks67's Custom Dragon Ball Plushies! Here he is! He turned out...meh. But for now here he is! 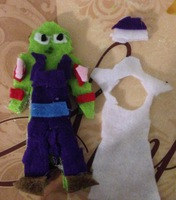 Pics: Piccolo,comparison and Without cape(yes its removable) and Whoops..is that a Old Trunks plush? Thanks! Next one is Super Saiyan Goku! Also, Sadly I might have to glue Piccolos turban,(removing the Removable feaure) because it's getting loose. 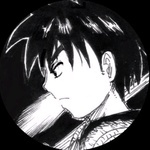 This reminds me of sevengear 's customs that he made out of toilet paper rolls and paper cutouts. It's different, and kind of cool because you can probably display them on your wall as you go.